Hi and Welcome again to my site! In case you are wondering who the heck this lady is, allow me to tell you! My name is Sharon, AKA MAMA, and I am an award-winning freelance writer (yeah I went there… hey if you don’t toot your own horn who will? ), author, special needs parenting advocate/public speaker (which means basically I do workshops for parents letting them in on the tricks I have learned along the way) and co-founder/Editorial Director/Publisher of ZOOM- Autism through many lenses Digital Magazine a free ONLINE resource and soon Zoom disABILITY a print version for the Metro DC area that focuses on all the things locally happening in the entire DC special needs community. I have written numerous feature articles, essays, columns and interviews which have appeared in many different Regional, National and International publications including: Chicken Soup for the Soul: Raising Kids on the Spectrum, Parenting.com, The Washington Post and more. 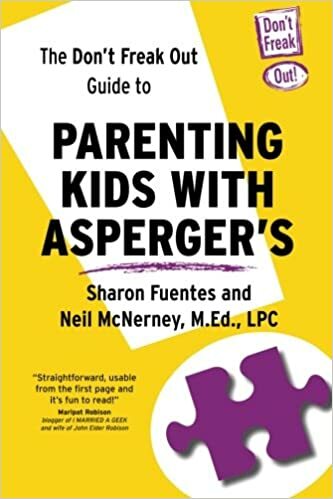 My first book, The Don’t Freak Out Guide to Parenting Kids with Asperger’s won Best New Special Needs Parenting Book by 2014 Expert’s Choice Awards about.com. (For more info & reviews of the book click the “About the Book” Tab and to purchase the book you can click the link or go to Amazon, Barnes and Noble or ask your local book dealer to order it!) I’m excitedly writing the sequel to Don’t Freak Out which will be the TEEN Edition sharing all the crazy and wonderful stuff we have learned as both my kids steer these choppy, yet interesting, waters. As for my personal life, I currently live with my hubby whom I have been with for over 20 years now (Thank you sweetie for putting up with my different type of crazy! Love you more, and you make me laugh…SOMETIMES!) Sorry but you will not see any pictures of Hubby… he is shy that way. You will see pictures of my Kiddos. I share a lot of their lives, but do know that I ALWAYS ask first and get their permission before pushing submit. With that in mind you should know a little about them. Jacob (whom yes in the beginning went as JAY but now wants to be called by his REAL name so we will call him by his REAL name) is almost 15 (GULP) and as you may have already guessed from some of these post is Autistic and brilliant and funny and talented (I could go on and on). He recently discovered a new passion for the Theater and I get such a kick seeing him shine up on stage! And then there is my sweet mini me, BELLA (who I used to refer to by her middle name Grace but now wants to be called by her nick name her friends have given her- Bella- which means beautiful in Italian and my girl is that inside and , so Bella it is) who is almost 13 but thinks she is 16. (UGH) Bella is not autistic, but she does have a few of her own challenges, as do we all. She is smart, sensitive, kind, has a razor-sharp wit and is extremely artistic! Every day her artwork gets better and better and watching her develop her passion is an incredible experience. And my family says I need to include our four legged family member too because he is just as important as everyone else. So here is STANLEY, whom we rescued, but in many ways he also rescued us! Awwwww! Little about the BLOG part of this site…. I started the blog in 2011 because it was cheaper than paying a therapist! Seriously, I needed an outlet and a way of connecting to other parents who for lack of a better way of putting it, “GOT IT!” I share the good stuff and sometimes the not so good stuff about raising children, being a working from home mom, a writer, wife and basically any other ramblings that come out of my wee little head. I guess I am suppose to also put some legal mumble jumble here. So here it is… Don’t be a jerk… don’t steal my stuff! Everything here is copyrighted and if you ask first most of the time I will just say “sure use it!” So just ask. Thanks. So… if you want to use something you found on here, would like to ask a question (I love it when you do), schedule an interview, speaking engagement, book signing or just say hi; email me at Sharon@sharonfuentes.com or click the Contact ME tab up above.